Lake Evelyn skirts the northern side of the Harper Road just to the south of Lake Selfe. It doesn't look particularly inviting but offers rewarding fishing for those anglers who accept the challenge. Lake Evelyn skirts the Harper Road to the right heading north just past the Ryton River bridge. Four-wheel-drive tracks make it possible to park right next to the lake. I must admit that I do prefer a lake with comfortable vehicle access and Evelyn is certainly one of those. 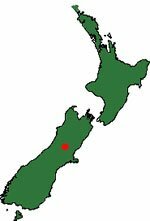 However much of the shoreline is shielded by raupo, matagouri, and swamp; all of which can make for difficult casting with the fly and spinning rod. Cars passing along the road stir up dust clouds and the howling northwester is never far away. Boats are permitted so long as they are not being mechanically propelled. A dinghy or kayak provides much better access than is available to the shore bound angler. If you do choose to fish from a boat please stay well away from other anglers fishing from shore. There is nothing more annoying when fishing for trout from the shore than having some dope constantly paddling back and forth within casting range! Lake Evelyn skirts the northern side of the Harper Road just to the south of Lake Selfe. It doesn’t look particularly inviting but offers rewarding fishing for those anglers who accept the challenge. There are good casting spots along the shoreline of Lake Evelyn adjacent to the road. There are brown and rainbow trout present in Lake Evelyn. Fishing methods permitted include artificial fly and spinning. The daily limit for Lake Evelyn is 2 trout. Open Season is from the first Saturday in November to 30 April. There is no winter season for Lake Evelyn. Veltics or Mepps blade spinners are an excellent choice when spin fishing but you need to exercise caution to avoid getting snagged. The lake isn’t very deep so keep your lures light so they don’t sink too quickly and catch on the bottom. Also when spinning move around the lake to take advantage of a tailwind when casting if possible. Being shallow the wind tends to stir the bottom and can discolour the water. With Lake Selfe and Lake Coleridge close by these might be better options if the water in Lake Evelyn is too discoloured. The careful fly rod angler with a stealthy approach can do well but the fishing will be blind once the wind gets up. 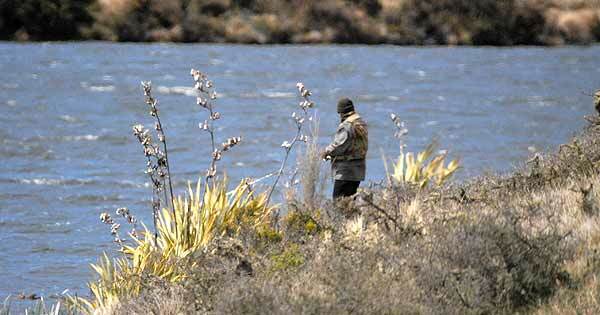 Lake Evelyn is a challenging Canterbury High Country lake on which to test your patience and angling skills. If you are clever enough to catch a trout in Lake Evelyn please email a picture to this website.